Two silk prints in primary colours on beige. £69 at Liberty. Flower strewn hat by Christian Dior Chapeaux. Beige shoes by Andrea Pfister at Bata International. Necklaces and rings from Hope & Eleanor. The new Liberty silks by Bernard Nevill are quintessential summer—sprigged or swagged with flower from the cornfield, the garden the riverbank, in primary colours on tinted grounds. For a hot sun day, a slate blue trellised blazer over a dress with sprigged pleats, for a sunshine evening, a dress of all sorts of flowers and paisley gathered into long skirt and round puff sleeves. The first look to make, the second to buy. Prints from Liberty’s Chameleon range designed by Bernard Nevill. Scanned by Miss Peelpants from Vogue, July 1971. Quilted jacket and wildflower pleats, left: Slate and black blazer, Vogue Paris Original Pattern 2499, designed by Ungaro. Blue flowered beige dress with long sleeves, long torso. Vogue Pattern 2469. Panama hat, by Diorling, from Debenham & Freebody. Suede shoes by Pedro Garcia. Clothes by Missoni. Butterflies and beads from The Purple Shop. Ottavio and Rosita Missoni are to Italian knit as Gucci is to leather. Using inspiration from original an unexpected quarters – a piece of antique porcelain, a fragment of embroidery, a picture painted by someone they then employ in their factory and train to use their knitting machines – together they produce the most beautiful knits in ravishing colours, extraordinary patterns and perfect shapes. Scanned by Miss Peelpants from Vogue, April 1971. Clothes by Missoni. Pendant from The Purple Shop. Shoes from K Shoes. Clothes by Missoni. Claret platforms by Charles Jourdan. Clothes by Missoni. Feather choker from The Purple Shop. Suede sandals by Pedro Garcia for Russell & Bromley. The most fragile face framed in glossy black hair to make the point. Midi dress by Zandra Rhodes from Fortnum & Mason, headband by Pablo & Delia, to order from The Shop. Hair by Oliver at Leonard. 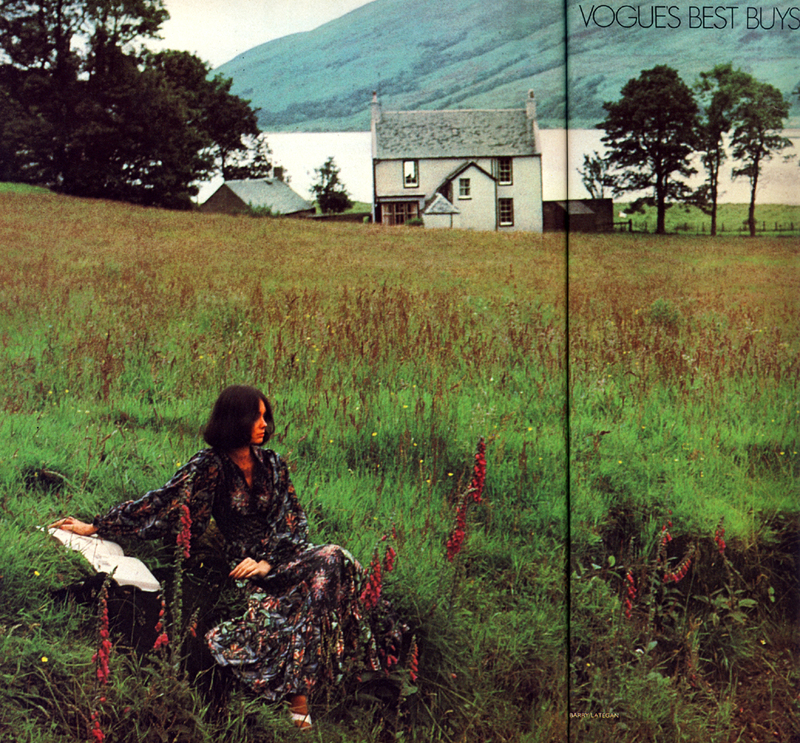 Scanned by Miss Peelpants from Beauty in Vogue, Autumn/Winter ’70-’71. This luxury’s a look, a feel and a fact, and nothing to do with money. It’s satin and silver and velvet and ciré, it’s snowy fake-fur. We show it in layers. You look like a million dollars. Alice Pollock of Quorum designed this satin lingerie to be the softest thing next to your skin. There’s a small bra, shaped quite naturally, knickers that button to the side, and a languid caped dressing-gown that fastens once and touches your toes. All spun round with satin ribbons and made in the most appealing pale shades – magnolia, pink or powder blue. Scanned by Miss Peelpants from Vogue, December 1968. 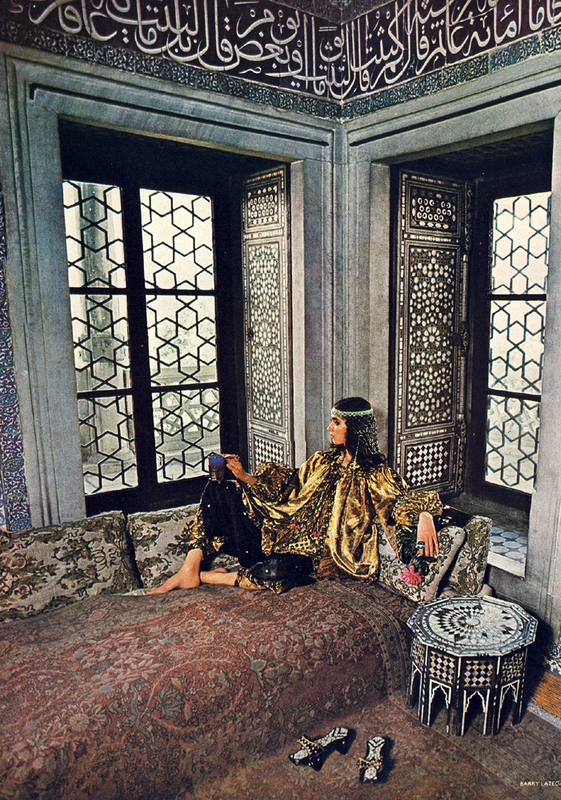 In the Baghdad Room of Topkapi, full of the ghosts of harem women, black and gold decorations to wear, baggy drawstring trousers, silks, velvets, netted and worked with gilded peacocks for a rich top with immense sleeves gathered in twice. By Bill Gibb for Baccarat. High lifted sandals at Thea Porter. 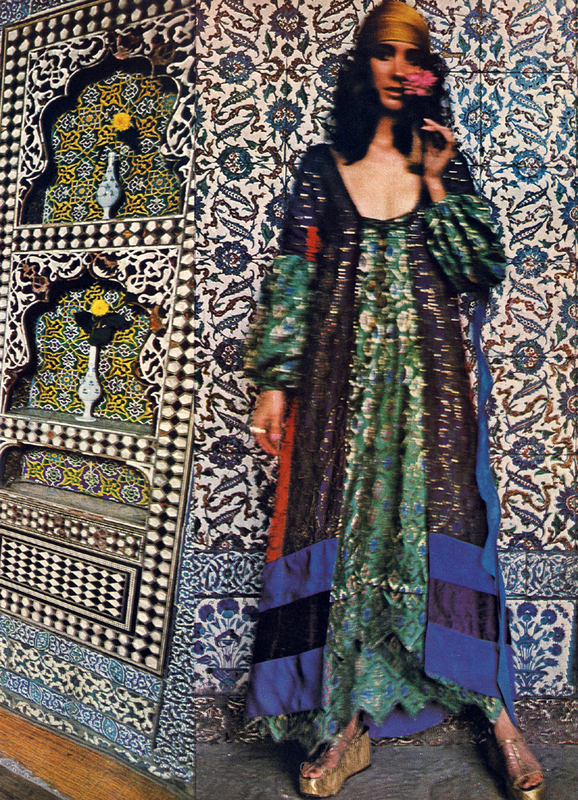 In the harem, green brocade with sleeves coming through and a pointed petal hem worn under Turkish evening blue – a coat the colour of the electric moment, panelled in scarlet and midnight and violet, flying pinked blue streamers. All to order at Thea Porter. Platform sandals by Andrea Pfister. Dress in Liberty Lantana print by Sujon. Scanned by Miss Peelpants from Vogue, October 1973.